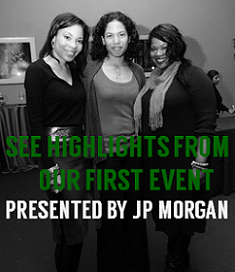 Dr. Karol E. Watson, renowned cardiologist, Jennifer Payne, Founder of S.T.A.R. 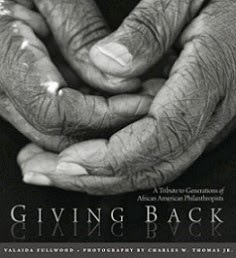 Foundation; Elaine Richardson Cook, Exec. Dir. 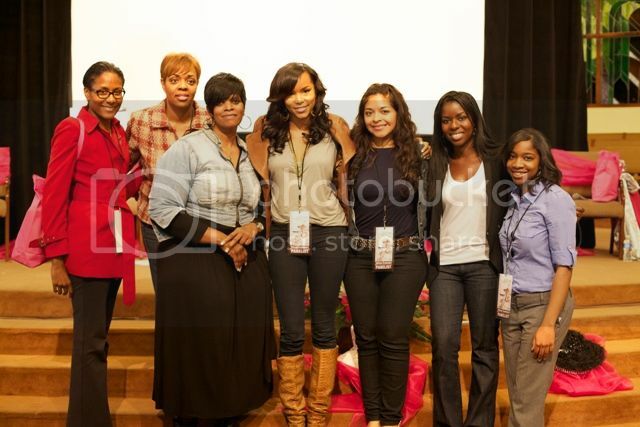 Jason Richardson Foundation; LeToya Luckett, Singer and Actress; Yesi Ortiz, Power 106 Radio Personality; Camille Winbush, Actress; and Heather Foster, Confidential Assistant to the Director of Faith Based and Neighborhood Partnerships at the US Department of Education serve as panelists for an empowerment session for girls at the Man Up Forum hosted by the Jason Richardson Foundation on February 19, 2011 in Los Angeles, CA. 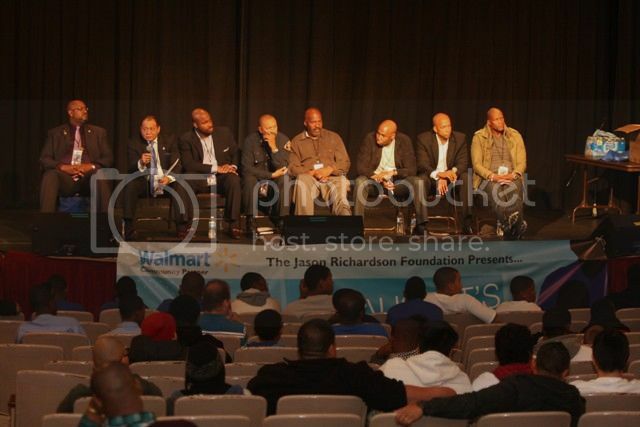 Los Angeles, CA—Walmart partnered with the Jason Richardson Foundation to support two-time NBA slam dunk champion and Orlando Magic guard Jason Richardson with the annual Man-Up Forum recently held at West Angeles Church in Los Angeles. 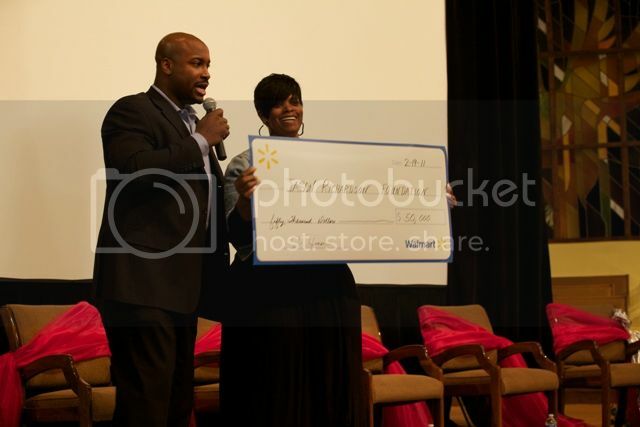 Walmart presented the foundation with a check for $50,000 to support the organization’s continued efforts to educate and serve youth ages 12 and up. Inspired by President Obama’s Fatherhood and Mentoring Initiative, the annual Man-Up forum featured leaders within the sports, entertainment, civic and corporate communities who addressed issues surrounding fatherlessness, mentoring, education, professional development and more. This year’s theme was “Uniting to Save Our Youth.” The forum featured breakout sessions to motivate and encourage young boys and girls to aspire to a brighter future. "Talk to the B.R.I.M.," an empowerment session for girls, included celebrity panelists Camille Winbush, actress, (The Bernie Mac Show); Yesi Ortiz, radio personality; and R&B singer/songwriter LeToya Luckett. 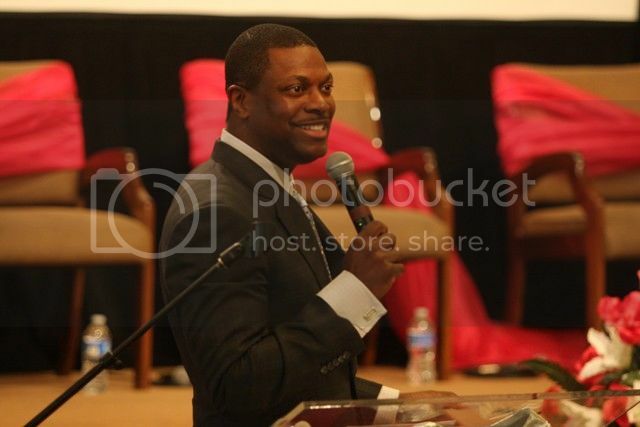 Actor and philanthropist Chris Tucker and author and mentor Thabiti Boone spoke words of inspiration to the young men. “Man-Up” means be responsible, stay in school and get good grades. Your weapon, both Tucker and Boone advised the young crowd, is your gift or talent. This is your hope that can be used to help you overcome all adversities and make a better future for yourself. On behalf of President Obama’s White House Fatherhood Mentoring Initiative, Boone presented the Jason Richardson Foundation Director Elaine Richardson-Cook with the President’s Service Award for the foundation’s outstanding community service. (L to R) Ethan Robinson, Deputy City Attorney, City of Los Angeles; Arthur Thomas, National President, Psi Beta Sigma Fraternity Inc; Lindsay W. Huddleston II, Sr. Manager for Public Affairs and Government Relations, Walmart; Brent Burton, Fire Captain LAC; Fluke Fluker, Co-founder, The Village Nation; Dr. Mark Jenkins, Renowned Cardiologist; Larry Newton, Regional Sales Dir., Gilead; and Dwayne Adway, Actor. Actor Chris Tucker talked to the audience about the importance of following your dreams. 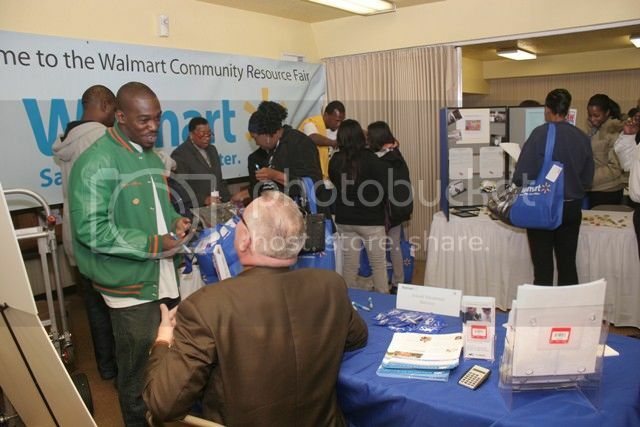 Immediately following the breakout sessions, guests visited the Walmart Community Resource Fair which featured 20 service organizations including: Big Brothers Big Sisters LA County; Real Mentors Academy, UCLA Admissions, California Employment Development Department, Urban League LA County, Jewish Vocational Services, and The Clinic. The Walmart Community Resource Fair featured 20 service organizations ranging from mentoring, health and wellness, and professional development. Lindsay W. Huddleston II, Sr. Manager for Public Affairs and Government Relations for Walmart presents a check to Elaine Richardson Cook, Executive Director of the Jason Richardson Foundation. For more information visit www.jasonrichardsonfoundation.org or call 866.406-7144.